I’m a DFID economist, working out of a public policy school, so Rachel Glennerster’s superb keynote presentation was like catnip to me. She talked about turning research into policy impact, a production function of sorts that remains something of a black box, despite being the presumed intention of all social science (as Rachel asked – if we’re not trying to change things, then why the hell are we here?). There aren’t many economists better placed to talk about this: her research pedigree is well-established, but she’s done time at HMT, the IMF and now DFID; her presentation well-reflected her experience. A lot of what she discussed focused on those margins of communication and engagement that don’t have a very direct return on the research incentives of an academic economist – things like repetition of the message (you don’t change minds with a single presentation); good use of descriptive data; focus on the broader literature and not just one’s own paper; and engaging in the language of policy rather than academia. She located her advice in a behavioural theory of research uptake by policy makers – something like quasi-hyperbolic discounting, with up front costs looming very much higher than substantial long-run benefits. More subtly, she was also appealing to the intrinsic motivation of researchers: much of the implied gain to better engagement from researchers was about using evidence to make the world better, at least in the dimension your research covers. (She did point out the research returns to gaining the trust of a policy partner, too). Coming from a policy background, I loved Rachel’s suggestions. My inner geek rejoices when a presenter at DFID spends 15 slides on identification, but I know they’ve lost the room before they get to their results; and my experience is that good descriptives and a strong story often carry more weight than a poorly explained or contextualised causal estimate. If researchers listen to her, I’m pretty confident policy makers will listen more to researchers. But in discussion with some of the people who commission research for DFID, they’ve surprisingly often pushed back at the idea that academics should be the people fighting for policy change. 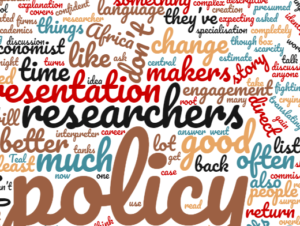 The skills required to have great policy impact and to be a great researcher don’t often overlap (though they sometimes do – as with Rachel). So perhaps this is a conversation crying out for an interpreter? More specialisation might not be the answer, but surely that job of translating good research into the language of politics and policy is or should be the central job of good think tanks. In any case, I am very much in favour of more direct contact between researchers and policy makers. It doesn’t just improve research uptake, but also the questions we choose to ask. On that note, before I started my career break from DFID, I spent a lot of time discussing what the right questions were if we wanted to investigate what is holding back job creation in productive activities in Africa, and in the afternoon, Francis Teal presented his take on it. It was a fantastic presentation, not least because he started it by explaining that the results he would present completely contradicted previous research he did. It smashed my priors, too: I went in expecting him to tell us there was a bargaining/rent sharing explanation for the high wages paid by large firms in Africa, but the story turns out to be much more complex, and at root one about the scarcity, and marginal return, of capital. I can’t do justice to the research here, partly because I will be digesting it for some time, but anyone interested in the topic should read it.